Rare edition with unique illustrations and elegant classic cream paper. This is the story of an Underwater Tour of the World and is a classic science fiction novel by French writer Jules Verne published in 1870. 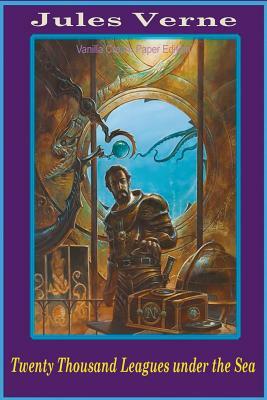 It tells the story of Captain Nemo and his submarine Nautilus, as seen from the perspective of Professor Pierre Aronnax after he, his servant Conseil, and Canadian whaler Ned Land wash up on their ship. On the Nautilus, the three embark on a journey which has them going all around the world. The book was highly acclaimed when released and still is now; it is regarded as one of the premiere adventure novels and one of Verne's greatest works, along with Around the World in Eighty Days and Journey to the Center of the Earth. Includes The unique vintage illustrations.